From John Patrick Shanley’s Prodigal Son, at City Center. A playwright enters dangerous territory when he attempts to dramatize his struggle to become an artist: a struggle that is supposedly resolved, or at least justified, by the artistry he now puts before us. When the play turns out to be less than thrilling — as was the case, for instance, with A.R. Gurney’s What I Did Last Summer — the disproportion between the setup and the result risks bathos, if not ridiculousness. John Patrick Shanley has often seemed on the verge of this sort of self-parody even in nonautobiographical works, like Doubt, that take dramatic fiction as close to the electrified fence of narcissism as possible without getting electrocuted. But that propinquity to danger is also where his power lies, a tricky problem that animates and partly defeats Prodigal Son, the latest of 11 plays of his to be produced by Manhattan Theatre Club. Telling the story of the two teenage years he spent at the Thomas More School in Harrisville, New Hampshire, years that confirmed him in his artistic path, it displays all of his mature talents for moral inquiry, rich dialogue, and compelling scene-making — and not incidentally creates a role that the 20-year-old actor Timothée Chalamet is able to knock out of the park. But Prodigal Son, like its biblical namesake, is also a mopey and vexing testament to the confusions of self-regard. Trying to climb that electrified fence has apparently shorted some of Shanley’s circuits. Jim: I am Rafael Sabatini. Louise: But if that was your name then you’d be Italian. Louise: What’s wrong with James Quinn? Jim: Come on. What is James Quinn when compared with Rafael Sabatini or Siegfried Sassoon? Louise: I think James Quinn is a fine outline, and it’s up to you to fill it in. Jim: I think my parents named me to work in the Sanitation Department. But soon enough, the faith of all three adults — in Jim and, through him, in their Catholic mission — is sorely tested by his various self-inflicted scrapes involving alcohol and apostasy. (He concludes that Jesus, like Thomas More, was a suicide by proxy.) 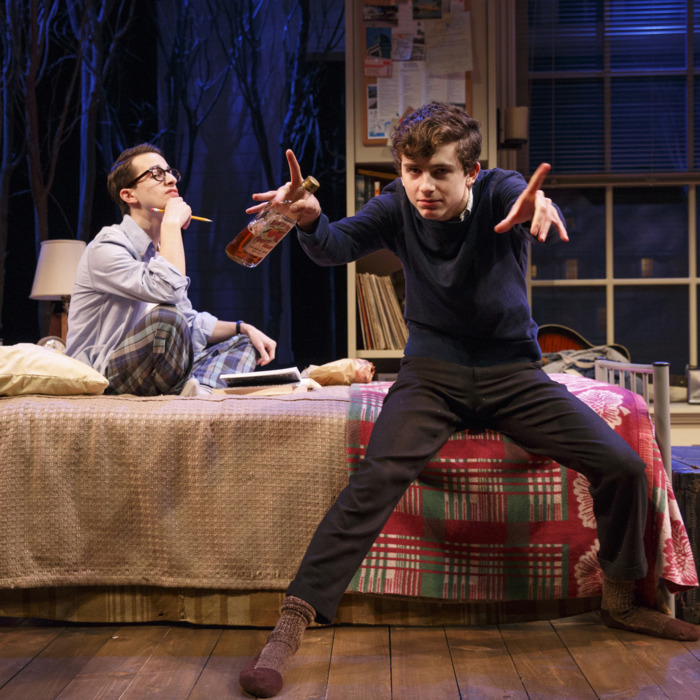 By the time “He’s the most interesting mess we have this year” devolves into “His struggle is taking up a lot of room,” the play has reached a murky depth of perplexity from which, unlike Doubt, it can’t seem to find its way back to the surface. I don’t even know whom I’m criticizing when I say, in teacherly fashion, that the work is promising but undisciplined; is that Jim’s fault, or Shanley the playwright’s, or Shanley the director’s? (This is one of those cases that confirms the conventional wisdom of not directing one’s own work.) Another intelligence, not so in love with the author’s, might have helped him prune deadwood, focus the narrative, avoid the whirlpools of narcissism, and possibly even eliminate the interstitial narration that too directly pleads for indulgence. In particular, Shanley appears to have come too close to the heart of his self-regard as the play reaches its climax in a crucial scene that tries to merge past and present, drama and commentary, naturalism and something very like a séance. It’s very moving, but it’s hard to like where it’s moving, as you begin to realize that the rabbit Shanley is hastily pulling out of the hat is himself. Chalamet, recently a featured player on Showtime’s Homeland but making his first New York stage appearance in Prodigal Son, very nearly makes even this work; despite all the difficulties of the role — not just capturing Jim’s pinwheel emotions but calibrating the right Bronx accent — his is one of the most accomplished debuts I’ve seen in years. Chris McGarry, a Shanley regular, is equally powerful in the much less showy role of the brush-cut headmaster, and Robert Sean Leonard as Hoffman does as much as possible with a character who doesn’t make much sense to us because Shanley, still seeing his teacher through a teenager’s eyes, cannot make sense of him either. That being the case, and knowing from the play that Hoffman, before he died, specifically asked Shanley not to write about him, I wonder whether this material was ill served, not just theatrically but morally, by its fully autobiographical treatment. (The names, except for Shanley’s, are barely changed.) It seems that Jim and John both take Thomas More’s example too much to heart, telling too much truth, or what they imagine to be truth, for their own good. Prodigal Son is at New York City Center Stage 1 through March 20.